Here, we discuss a case of Stage IV psammoma-rich high-grade serous ovarian carcinoma that was initially suspected on bone scintigraphy by the presence of unusual soft tissue calcification within the metastatic sites. A 30-year-old female patient with unremarkable medical history presented with a painless palpable parasternal mass. Physical examination confirmed a rounded parasternal nodule on the left side, nontender, and partially fixed to the underlying chest wall and an ipsilateral enlarged supraclavicular lymph node. These findings were confirmed by initial radiological workup with ultrasound. Subsequent magnetic resonance image of the thorax demonstrated multiple other similar nodular masses with same appearance and characteristics spread in the anterior thoracic chest wall, left-sided supraclavicular lymphadenopathy, and massive right-sided pleural effusion. These findings were highly suspicious of malignancy. The patient was referred to the Nuclear Medicine Department for technetium-99m (Tc-99m) methylene diphoshonate (MDP) bone scintigraphy to evaluate for osseous metastatic disease. Planar whole-body images [Figure 1]a were acquired 2.5 h after intravenous injection of the bone-seeking agent Tc-99m MDP. Although no abnormal bone uptake was seen, extensive extraosseous activity was noted throughout the pelvis and abdomen as well as some foci of increased uptake in the thorax. 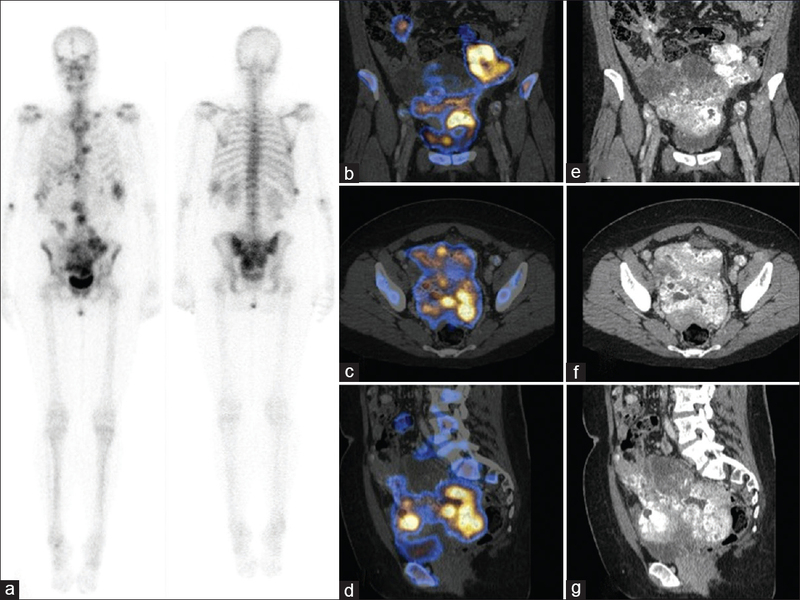 Additional single-photon emission computed tomography (SPECT) with low-dose CT images [Figure 1]b, [Figure 1]c, [Figure 1]d of the abdomen and pelvis precisely visualized radionuclide accumulation in calcified soft tissue metastases, without any pathological uptake in the bone. These findings were confirmed with diagnostic contrast-enhanced CT evaluation [Figure 1]e, [Figure 1]f, [Figure 1]g and consistent with widespread omental and peritoneal metastatic deposits. Given these findings, an excisional biopsy on the left supraclavicular lymph node was performed. Histopathological examination was compatible with high-grade papillary serous adenocarcinoma of the ovary, with multiple psammoma bodies in the tissue sample. These psammoma bodies contain a high content of calcium, responsible for the extraosseous uptake of Tc-99m-MDP. Abnormal extraskeletal accumulation of the bone-seeking radiopharmaceuticals has been documented previously for many benign as well as malignant conditions and can be explained by the affinity of the Tc-99m-labeled diphosphonate for hydroxyapatite crystals and calcium precipitates., These soft tissue calcifications may be microscopic and beyond the resolution of conventional radiographs. Soft tissue metastases from ovarian papillary serous adenocarcinoma are known to show high affinity for Tc-99m MDP, explained by the high calcium content of concentrically laminated psammoma bodies. This case report illustrates the importance of careful interpretation of a whole-body bone scintigraphy on the presence of unusual nonosseous tracer accumulation as well as the additional value of hybrid SPECT-CT for further clarification. Bharwani N, Reznek RH, Rockall AG. Ovarian cancer management: The role of imaging and diagnostic challenges. Eur J Radiol 2011;78:41-51. Sharma SK, Nemieboka B, Sala E, Lewis JS, Zeglis BM. Molecular imaging of ovarian cancer. J Nucl Med 2016;57:827-33. Kaye J, Hayward M. Soft tissue uptake on 99mTc methylene diphosphonate bone scan imaging: Pictorial review. Australas Radiol 2002;46:13-21. Shiomi S, Kuroki T, Hasegawa I, Nishio H, Azuma K, Ochi H, et al. Accumulation of tc-99m HMDP in hepatic metastasis from colon carcinoma without detectable calcification. Ann Nucl Med 1996;10:347-9. Kikuchi T, Sugawara Y, Kajihara M, Nakata S, Mochizuki T, Ikezoe J, et al. Accumulation of tc-99m HMDP in ovarian serous papillary adenocarcinoma reflecting ongoing calcification. Clin Nucl Med 2001;26:886-7.